The Honda Civic concept. The 10th-generation Civic sedan goes on sale this fall, followed by the coupe this winter. Honda dealers and fans have plenty of fresh products to look forward to, as the company weaves into its lineup more turbocharged engines, a resurrected truck, a dedicated plug-in hybrid and perhaps even a sports car. Fit: The Mexico-built subcompact, redesigned for 2015, is Honda's affordability play, so don't expect sweeping changes (or turbos). A refreshed Fit should arrive for the 2017 or 2018 model year with only mild changes. 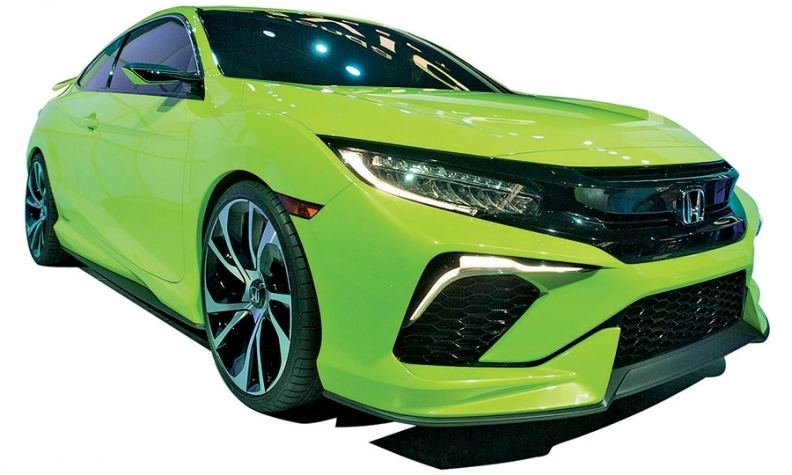 Civic: When the 10th-generation Civic sedan goes on sale this fall, the redesigned model will ride on a new modular platform and will offer an optional 1.5-liter, four-cylinder turbocharged engine, the first of its kind for any Honda Division vehicle in the U.S. Ever. The 2.4-liter, naturally aspirated four-cylinder base engine and continuously variable transmission will carry over from the previous generation. This winter, the Civic coupe will debut, followed shortly by the resurrection of a five-door Civic hatchback. The Si model also returns, likely using the 1.5-liter turbo that's been juiced for more power. And that long-forbidden fruit, the Civic Type R hot hatch, will finally land stateside. Look for Honda's 2.0-liter turbocharged four-cylinder to make at least 300 hp when this model -- assembled in Honda's Swindon, England, plant using a U.S.-built engine -- debuts in the U.S. in 2016 as a 2017 model. Accord: Honda's midsize sedan and coupe get a light freshening this fall that will also see the addition of Apple CarPlay and Google's Android Auto linked systems and Honda Sensing, an optional suite of autonomous safety and driving features. A full redesign will debut in 2017 as a 2018 model and will switch the Accord to the same new modular platform that underpins the upcoming Civic. With this generation, look for Honda to use the 1.5-liter turbocharged four-cylinder as a base engine, and a 2.0-liter turbo four as the optional engine, spelling the likely end of the Accord's V-6 option. Plug-in hybrid: The Accord plug-in and Insight hybrid were jettisoned for 2015, and there is little news about a hybrid version of the next Civic, but that doesn't mean Honda is ceding ground in the hybrid space. 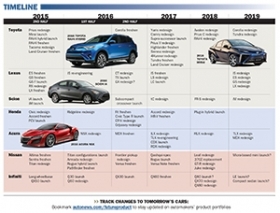 A dedicated plug-in hybrid model (name unknown) is expected in 2018. It will be roughly the size of the new Civic and should carry a hatchback shape, similar to the Insight and the current Prius. FCV: While Toyota is getting plenty of attention for its Mirai hydrogen fuel cell car that hits the road this fall, Honda won't be too far behind. Still referred to as the FCV for now, this car is expected to beat the Mirai's 312-mile EPA-rated range when it debuts later this year. Expect it to sell for around the same as the Mirai's $58,325 base price, which includes shipping, before any incentives. Sports car: The stars are lining up for a Honda-badged sports car: Acura's NSX (sold in other markets as a Honda) goes on sale soon; patent drawings were filed by Honda this year showing a midengine sports car; dealers are eager for a successor to the S2000 and Honda's new CEO, Takahiro Hachigo, has stated publicly that he wants more exciting cars from Honda. So look for one by the end of the decade that uses the 2.0-liter turbocharged four-cylinder engine from the Civic Type R and a dual-clutch transmission. HR-V: All new for the 2016 model year, this tidy crossover based on the Fit should see a refresh at the end of 2017 or early 2018. Don't expect major powertrain changes yet. CR-V: After a light refresh in 2015 and the addition of a CVT, the CR-V should get a redesign at the end of 2016 for the 2017 model year. At that point it will likely drop the 2.4-liter four cylinder in favor of the 1.5-liter turbo that's headed to the Civic and Accord. The CR-V should also switch then to a modular platform. Pilot: The redesigned 2016 model is on sale now with sleeker styling, a six- or nine-speed automatic transmission, a new Elite top-level trim and a 3.5-liter V-6 engine. Odyssey: Honda's minivan will get a redesign in the second half of 2016 as a 2017 model. Look for it to follow the same trim strategy as the recent Pilot: nine-speed automatic transmission on the top Elite and Touring trims, with a six-speed automatic on the rest. The 3.5-liter V-6 should remain. No word on whether vacuum cleaners carry over. Ridgeline: Expect a redesigned version of Honda's truck to debut later this year and go on sale in 2016. It will ride on the same light-truck platform that underpins the Odyssey and Pilot and will share their 3.5-liter V-6 engine and six-speed automatic transmission. This second-generation Ridgeline will look more like a traditional truck than its predecessor, but expect more of the innovative features that set the original model apart -- such as a liftgate that opens to the side and downward, and in-bed storage.